Home › FAQ › Why Do You Have to Pay An Application Fee to Apply to College? As you explore your college options, you may be wondering why you pay an application fee when applying to college. With so many expenses related to getting to college education, it may feel frustrating to have to pay a fee just to apply. While it can be difficult to research a clear answer to this question, there appear to be some generally accepted common-sense reasons for college application fees. It can be harder to ferret out why application fees can sometimes be so high, or why they vary so much from school to school. The good news, however, is that there are sometimes ways you can get fees waived. Perhaps the most common-sense reason that colleges charge application fees is the obvious one: colleges have expenses. 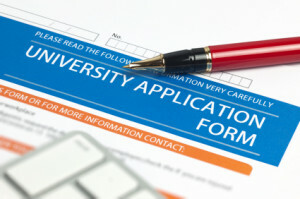 Although some colleges still accept traditional applications and others encourage or prefer online applications, someone in an admissions office needs to read through and process all applications. That takes time, and colleges generally charge application fees to help offset administrative costs involved. For some larger schools who charge higher fees, the amount of revenue generated from application fees can total a pretty significant amount, but for smaller schools, the total is really not all that huge. That may be small consolation when you are faced with an application fee that feels challenging to pay. With the average cost of a college application at $37.88 as of 2012, fees for families can definitely add up, according to Marketplace. That’s especially true if you choose to apply to multiple colleges or to more prestigious schools that tend to charge higher than average fees. In addition, there are other expenses involved in exploring and preparing for college including campus visits, SAT and ACT tutoring and fees, and once you are accepted somewhere, tuition and housing fees. Sometimes the sheer weight of all those fees, when taken together, can feel overwhelming. You may find that this actually helps you to be more selective about your choices of where to apply, and that’s not necessarily a bad thing. While it’s not good to put all your eggs in one basket, limiting your college choices to a handful may help lessen your anxiety and help you to think about what you really want from higher education. However, if paying an application fee is a real hardship, there are sometimes ways you can get fees waived. Many colleges will waive the fee completely if there is actual economic hardship. It usually necessitates a note from your high school guidance counselor letting the college know of the hardship, according to College Confidential. Other colleges will either waive fees or offer discounts if you will apply online rather than mail in a paper application. Colleges generally charge application fees as part of their regular admissions process and to help them offset administrative costs. While such fees can feel frustrating and perhaps even overwhelming when you’re in the midst of exploring college options, don’t let them block you from applying somewhere you feel passionate about. More important than why you pay an application fee when you apply to college is your discernment process and goal-setting that will help you to move ahead in your education.